Outstanding cornering characteristics. The closed outer shoulder of the tyre enables it to withstand more extreme lateral forces. This results in outstanding handling and good cornering stability. Excellent protection against aquaplaning. An open inner shoulder and wide grooves running around the circumference displace water rapidly in rain. This protects against aquaplaning. Visual wear indicator. A tread-depth indicator responds to tread wear and visually alerts the user in good time when the tyre has to be replaced. New summer tyre tread, expanding the offer of tyres for lower and medium class cars, with an asymmetric pattern of a timeless design, reflecting the latest trends and knowledge in the tyre treads development. Compared to the previous MP15 tyre, the boundaries in the area of safety and comfort have been significantly shifted. The decreased level of noise positively influences comfort, while the new shape, mixture and configuration mean a higher lifetime. Due to different properties, the pattern is divided into the inside and outside parts. The task of the outside part is the maximum transfer of forces during acceleration, deceleration and drive direction changes. For this reason, the outside part is composed of more massive pattern blocks with a higher share of the material in the area of the tyre trace. The inside part is composed of blocks of smaller widths with larger grooves that provide for water drainage from the central zone, which improves the road contact on wet surfaces, thus allowing a safe transfer of propelling and brake forces. The tyre tread uses a new technology - VOC FREE – of the preparation of an ecological silicone tread mixture with a low rolling resistance and a high adhesion to both dry and wet roads. The mixture includes an applied silanisation activator of a new generation, which ensures lower VOC (volatile organic compounds, e.g. alcohols) emissions compliant with EU standards, an ecological RAE-type plasticiser, and it also uses a new high-efficient processing admixture, which in combination with the silanisation activator significantly lowers the rolling resistance of the tyres. Noisiness is decreased using a different layout of pattern inserts of the outside and inside parts and due to the shape of pattern blocks, designed taking into account the comfort and rigidity of the tyre tread. 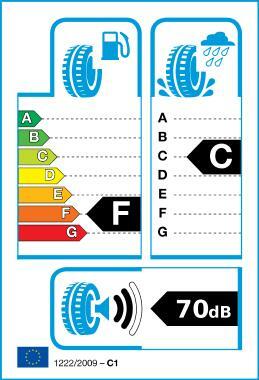 The design of the sidewall is made in a plastic way in a combination of soft shapes, allowing the characteristic features and the group of information elements to come out, which offer the customer information about the lifetime development and the position of the tyre tread on a vehicle. The in-pattern indicator informs about the remaining status of the pattern depth.